Ennakoiva kunnossapito on yhä tärkeämpää, kun yritykset haluavat minimoida seisokeista aiheutuvat kustannukset (joillakin aloilla tyypillisesti 1–3 % liikevaihdosta, ja jopa 30–40 % katteesta). Fluke 1587/ET-paketti on suunniteltu nimenomaan vianhakuun ja ennakoivaan kunnossapitoon. With the Fluke 1587, perform insulation tests, plus a wide-range of DMM tasks with confidence and ease. Two products in one: Powerful and full-featured multimeter. Ideal for work on motors, cables, and switch gear. Filter for motor drive measurements. Insulation test (0.01MΩ to 2GΩ). Insulation test voltages (50 V, 100 V, 250 V, 500 V, 1000 V) for many applications. CAT III 1000 V /CAT IV 600 V overvoltage rating for added user protection. 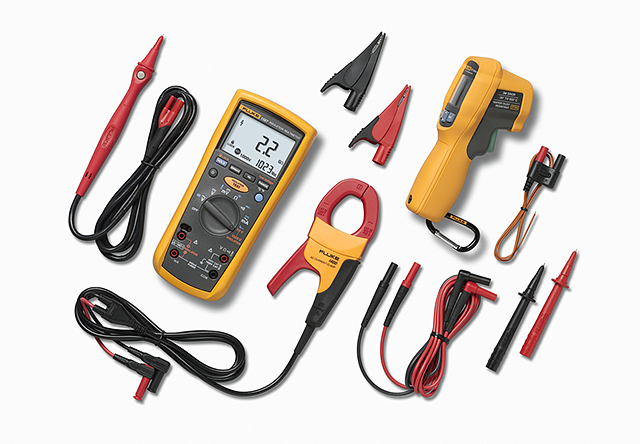 Use the Fluke i400 with your Fluke 1587 to accurately measure AC current without breaking the circuit. Use with your Fluke 1587 to measure 1A AC to 400 A AC. 1 mA/Amp output guarantees easy reading. CAT III 1000 V / CAT IV 600 V overvoltage rating for added user protection. Specially designed to offer maximum utility in a very compact shape. Maximum conductor: Ø 32 mm. Meter can perform at least 1000 insulation tests with fresh alkaline batteries at room temperature. These are standard tests of 1000 V into 1 MΩ with a duty cycle of 5 seconds on and 25 seconds off.